Before our baby was born, we started getting ready for her arrival by spending tons of money on baby gear. We managed to get the basics before her early arrival, and caught up on the rest later. Though it's misleading to say that we "caught up" as we are still hemorrhaging money on baby stuff on a regular basis (my credit card statements look like this: Target, Amazon, Amazon, Target, Target, Netflix, Amazon, Amazon, Target, Amazon, etc). 1. One of the first items that we purchased was a crib. Keeping in mind our color scheme for the baby room (white/gray/turquoise/yellow), we decided that we wanted a white crib with a modern look to it. I searched for a crib that was made of solid wood (to avoid potential fumes from glue used in MDF) and had extra storage (as we live in a small place and always lack storage space). After much research, we decided to go with Babyletto Mercer 3-in-1 crib in white. It has multiple levels for the mattress and converts into a daybed and a toddler bed. This crib is almost entirely made of solid wood, with the exception of the drawer, which is MDF. I made peace with that because this crib was already on the higher end of our price range ($400), and the other options that had the modern look to them and were 100% solid wood were much pricier. We are very happy with this crib, and the drawer provides the much needed space to store extra diapers and other supplies. For the record, our baby didn't like sleeping in the crib for a long time. I think it felt too huge for her, after the tight comfort of the womb. We borrowed a bassinet from our friends, and she slept in it for about a month until she grew out of it. 2. We splurged on the crib mattress, as we decided to buy an organic mattress that didn't emit crazy fumes from the fire retardant treatments that are sprayed all over baby stuff. During pregnancy, I was like a blood hound, super sensitive to smells of any kind. We bought the Naturepedic Organic Cotton Lightweight Classic Crib Mattress, which is very firm and has the added bonus of weighing only 11 pounds, making sheet changes a breeze. We love this mattress, and our daughter has grown used to sleeping in the crib lately, so she seems happy to sleep on this mattress as well nowadays. 3. I was excited about crib sheets because there are so many beautiful options out there, and this was my chance to bring the yellow and turquoise/aqua colors into the baby room. Besides the colors, I also looked for something that was 100% cotton. We originally bought three crib sheets from Land of Nod: aqua, yellow with white dots, and blue waves. The sheets fit our crib mattress snug (like they are supposed to), and held up well through many washes. However, while these sheets are truly beautiful, I can't really say that they are very soft. That's one of the drawbacks to online shopping: you can't feel the texture of what you are buying. We resorted to putting a receiving blanket over the sheet to make a softer surface for our baby to sleep on. Since it is winter now, we bought another sheet that is flannel, and while it is quite plain, it is also very soft. 4. Funny story about the infant car seat: we bought it in July, but by the time I was admitted to the hospital for delivery, we still had not installed it. We had the presence of mind to throw it in the trunk of the car when we left for the hospital, and D ended up installing it right in the hospital parking lot the night before our baby was born. We bought the Chicco KeyFit 30 Infant Car Seat in Pulse for several reasons. It had good reviews, is known for easy installation (which turned out to be true), goes up to 30 pounds (in terms of baby weight, though I can't imagine lugging such a heavy baby around in a car seat), and has an infant insert, which turned out to hold our tiny baby pretty well. I am generally happy with our car seat. If I were to change anything about it, it would be to give it a larger canopy, but that's a very minor detail. The red color was D's choice, and while I wouldn't normally go for red, I must say that I ended up really liking this color. 5. When choosing a stroller, we kept in mind that it had to be lightweight, easy to fold down and store, and small enough to fit into the trunk of my not-very-big car. We decided that the easiest option for us in the beginning would be getting a stroller frame for the infant car seat. So far, it's been working out really well. The small footprint of this stroller has the added bonus of being easy to navigate on the city streets and in tight aisles of the grocery stores. It's also really easy to snap the car seat into the frame (there is no way to screw it up). The only drawback is that once our baby grows out of the infant car seat, we will have to get another stroller, but that could be a long way down the road since we don't have a big baby. 6. I had two criteria for choosing a diaper bag: one, it has to be practical, and two, it had to look good. Most diaper bags fit the first criteria but not the second. I read a lot of reviews on diaper bags, and it seemed to me that the biggest complaint was that the bags didn't fit all the things that the mamas wanted to fit into them. But as the reviewers listed all the things they tried to cram into the bags, I wondered why they need to carry SO MUCH STUFF with them! You might think that I was naive in my pre-baby way of thinking, but I have to say that the diaper bag I chose had those same complaints in the reviews, and yet I am very, very happy with its capacity and its appearance. The diaper bag I bought is the JJ Cole Swag Diaper Bag in Silver Drop, and I highly recommend it. Yes, it still looks like a diaper bag, but it looks stylish and doesn't break the bank. 7. About six weeks after our baby was born, I felt like I was going to go insane. We hadn't bought anything like a rock-n-play or a bouncer to put the baby in, and she was too small for any carrier at that time, which meant that the only way to keep the baby from screaming her head off was to carry her around everywhere. I learned to do everything one-handed: eat breakfast, fold laundry, make the bed (haha, just kidding! no one made the bed back then). But really, sometimes, I needed a break from being permanently attached to the baby. She was too big for the bassinet (which we used to put on the table in the kitchen and lay the baby in it so she could hang out with us during meals), and didn't want to stay in the crib or play by herself (we later got an activity mat with hanging toys, and she now enjoys independent playtime). So, we finally bought a bouncer. And the baby hated it. I think it's because she was too small for it at that time. I also hated it because it was a pain to assemble, and the vibrations and the tunes didn't even work. The defective bouncer went back to the store. A couple of weeks later, two months in, we bought a different bouncer: Fisher-Price Deluxe Bouncer in My Little Snugabunny. I went back and forth about whether to splurge on the MamaRoo bouncer, but in the end couldn't justify spending that much money on something the baby may or may not like, and something that would only be useful for a few months anyway. In any case, we lucked out with the bouncer we bought: she likes it, and takes really good naps in it during the day. And I use both hands to eat nowadays. 8. Ahh, baby wearing. I must say that I really enjoy it. Before I did any major research into baby carriers, I was mostly aware of two types: a wrap-type carrier and a structured carrier. Turns out, there are many more types of carriers out there. After reading about the many types, I decided that a soft-structure carrier was best for me. The Moby wrap intimidated me, and the slings appeared to unevenly distribute weight to one shoulder (though I never tried them, so this may not be true). I really wanted to invest in only one carrier that would last me a long time. Mostly, I heard about BabyBjorn and Ergo, so at first I wasn't even aware of other options. The reviews and experiences of other parents with these two carriers worried me - BabyBjorn appeared to cause back problems when the baby grew heavier, and the Ergo required an infant insert (which is very warm and would not work for us in the first, warmer months) until the baby was 12 pounds. The Ergo also seemed difficult to put on because it has a strap across the top of the back. I was looking for a carrier that would be suitable for a tiny baby without an insert, would provide back support for when the baby grows, and would be easy to put on. The Beco Gemini baby carrier met all my requirements (it is suitable for babies as small as 7 pounds), and I've been very happy with it. We bought the Beco in Stella color scheme. There were a few other items we needed right away for the baby: storage for clothes and diapering supplies. We had a dresser that we dedicated for storage of baby clothes and other baby paraphernalia (which means that we currently don't have a dresser for ourselves, a problem that we hope to address once the baby actually moves to her own room). Instead of buying a changing table (for which we have no room), we put a changing pad on top of the dresser. Speaking of changing pads, buying one was less straightforward than one might think. I ordered a standard changing pad on Amazon (I think it was Summer Infant brand, which came recommended), and when it arrived it reeked of chemicals. My then-pregnant blood-hound nose couldn't handle it. I tried to air it out for a couple of weeks, but the stench would not go away. I returned the changing pad and decided that I had to buy one in person, even if it meant spending more money on it. I couldn't risk another odor debacle. So I went to Babies R Us and sniffed every changing pad they had (I will pause while you deal with that mental image). Finally, I settled on a Serta contour changing pad. Sure, I could have bought an organic changing pad that would not have smelled at all, but I wasn't willing to spend $100 on it. It seemed less important to have an organic changing pad than an organic crib mattress, where the baby would spend much of her sleeping time. I also decided to buy a changing pad cover because my baby did not enjoy being naked on the cold plastic of the changing pad. I bought Aden + Anais bamboo cover in aqua. It is very soft and goes well with our color scheme. However, after three months of many washes, it has shrunk and no longer fits well on our changing pad. I am having a hard time finding a soft changing pad cover that isn't polyester-based and won't shrink over time. In desperation, I've ordered two more Aden + Anais covers, but any recommendations are welcome. Baby-related expenses are never-ending, and we are buying more baby items as we need them (for example, we just bought a travel crib for upcoming travels), but these are the basics that we found useful in the first several months of baby's life. 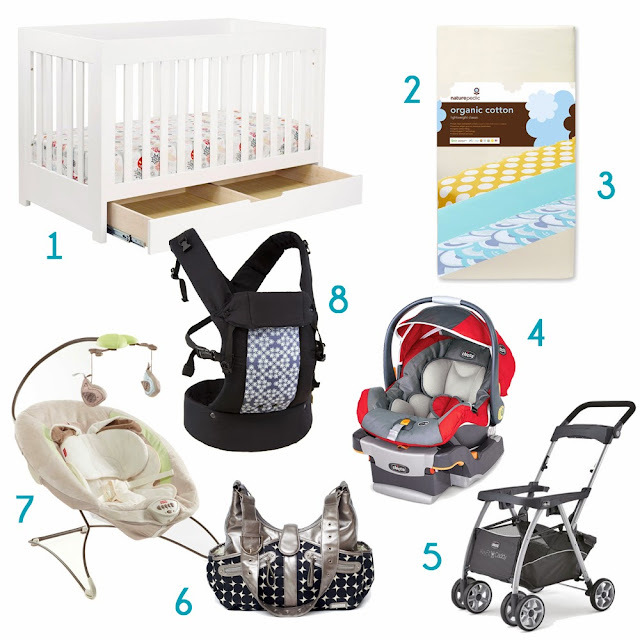 What is on your list of must-have or nice-to-have baby items?